Information and communication technologies can be a vital cog in SA's ambitious R100 billion investment drive. This was the message from president Cyril Ramaphosa when opening the International Telecommunication Union (ITU) Telecom World 2018 conference in Durban yesterday. Organised by ITU Telecom, part of the ITU, the UN agency responsible for ICT-related issues, the event is a global platform for accelerating ICT innovations. It aims to deliver economic development and social good faster through its exhibition for digital solutions, forum for sharing knowledge, and networking hub connecting nations, organisations and individuals. "It is an honour, as the government and the people of South Africa, to host this event for the first time on the African continent," said Ramaphosa. SA recently embarked on an investment drive to attract $100 billion in new investment in the country over the next five years. This is part of a broader effort to set the economy on a new path of growth, employment and transformation, Ramaphosa said. "We will be holding an investment conference on 25-27 October, where we will showcase the country's lucrative investment offerings. We are determined that the ICT sector be an integral part of this investment drive, with a focus on infrastructure investment, e-commerce, local manufacturing of equipment, and innovation." He noted that SA has demonstrated its capabilities in the development and deployment of ICT. "We expect that the investment conference will help to demonstrate the country's great potential." 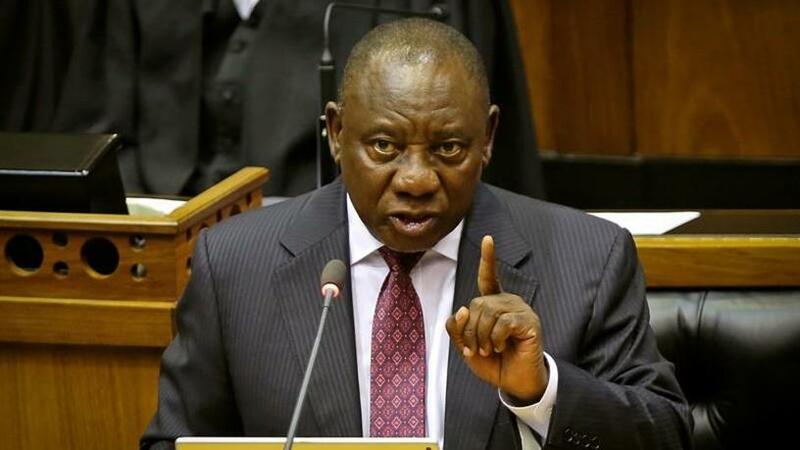 According to Ramaphosa, there are currently 20 million South Africans who do not use the Internet for a range of reasons such as unaffordable data prices, lack of Internet-enabled devices and lack of access. However, he pointed out that about 87% of households in SA have access to mobile phones, presenting the country with a great opportunity to overcome digital exclusion and drive inclusive growth and innovation. He added that government recently decided to accelerate the licensing of the radio frequency spectrum in the 2.6GHz, 700MHz and 800MHz bands to hasten the growth of mobile communications. "We have finalised consultations with the telecommunications industry and other stakeholders to ensure allocation of spectrum reduces barriers to entry, promotes competition and reduces costs to consumers." He noted that following a Cabinet decision last month, telecommunications regulator, ICASA, is now preparing to license available high-demand spectrum. "In addition, we have begun work in preparation for 5G spectrum licensing as part of our efforts to build a smarter digital economy." He also pointed out that earlier this year, SA announced plans to establish a Digital Industrial Revolution Commission to ensure the country is in a position to seize the opportunities of the rapid advances in ICT. "We are informed by research that associates investment in ICTs with such economic benefits as higher productivity, lower costs, new economic opportunities, job creation, innovation and increased trade. Information and communication technology also helps provide better services in health and education and strengthens social cohesion. "Our work in this area coincides with agreement on the establishment of an African Continental Free Trade Area, which will create a single market of over a billion people." Ramaphosa pointed out that at the Plenipotentiary of the African Telecommunications Union held last month in Nairobi, SA was mandated to lead a five-country committee to co-ordinate the development of the continental response to the fourth industrial revolution. "This is a task that we undertake in support of the African Union's Agenda 2063, which seeks a continent with diverse and inclusive economies, advanced infrastructure and a skilled and capable population. In promoting this vision, we see a key role for technology." According to Ramaphosa, SA continues to champion the Internet as a tool for social and economic development. "We support universal broadband and universal broadcasting to connect all citizens and ensure they have access to information. Most recently, we have advocated for the safety of ICT infrastructure and secure use by all online." Important to Africa and developing countries, he said, is the need for countries to share manufacturing and localisation opportunities to allow equal access and shared growth throughout the world. "We support equitable access to global ICT resources such as orbital slots, satellites and governance of the Internet. "It is our task to ensure the fourth industrial revolution improves the human condition and that no one is left behind. It is our task to ensure this digital revolution responds to the needs of the developing world. It must assist in overcoming unemployment, not exacerbate it. It must bridge the digital divide, not widen it. "It must employ the latest in communications technology and data analytics to solve some of the world's greatest development challenges." Ramaphosa believes that as economies become increasingly dependent on ICT, it is critical that governments work more closely with industry to maximise the value of digital innovations. It is equally critical that both government and industry develop effective collaborative relationships with the communities they are both expected to serve, he said. "It is such relationships that are required, for example, for the accelerated rollout of broadband in areas that are generally seen as not being economically viable. And yet, the presence of broadband in such areas is vital for the viability of the economy. "The rapid expansion of broadband reach and accessibility is a priority in South Africa because it is a key determinant of economic inclusion."